The first official trailer for the Penguins of Madagascar has been released by DreamWorks and 20th Century Fox, featuring an all-star cast including Benedict Cumberbatch and John Malkovitch. The new animated film, which is due in cinemas in time for Christmas, is a spin-off from the popular Madagascar series and is tipped to be one of the blockbusters of the year. The 3D comedy adventure follows fan-favourite penguins Skipper, Kowalski, Rico and Private in their very own spy thriller. John Malkovich plays villain Octavious Brine, while Benedict Cumberbatch (best known for his role as Sherlock) voices a suave wolf named Classified. 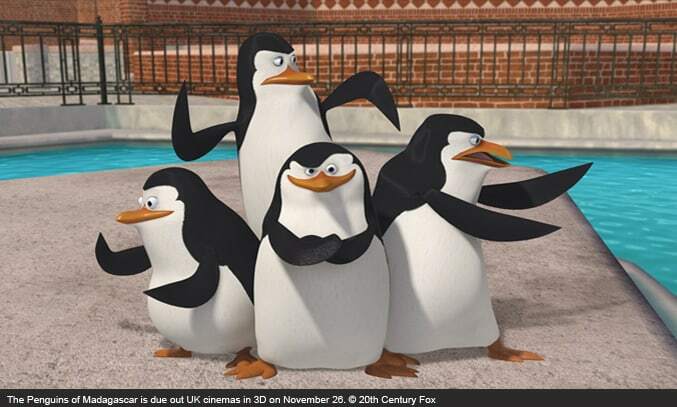 The Penguins of Madagascar hits UK cinemas in 3D on November 26.